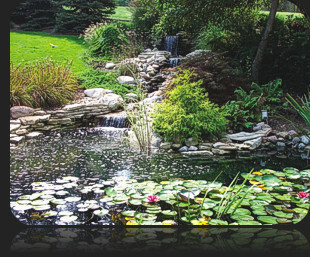 Outdoor water ponds or water gardens are becoming the fastest growing backyard garden feature in the country. 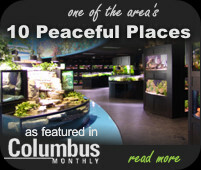 They are easy to set up and maintain, particularly if you follow the same rules and guidelines for keeping an aquarium. You will want to determine the best size, shape and location for your particular situation. Making the decision to keep fish, means installing a filter and providing on-going maintenance to insure adequate water quality. Planting the pond is the most enjoyable part because there are so many plant choices and everyone gets to create their own garden! Take time to plan the location of your pond. For maximum enjoyment, several viewing points should be considered. Locations near trees can pose a problem. Encroaching roots can damage the bottom of the pond and leaves that fall in can clog the filter as well as add too many nutrients to the pond. Low lying areas should also be avoided. During heavy rainfall, the runoff from high ground will collect in and overflow your pond. Close proximity to electric is another important factor in the final decision regarding location. When installing a pond in the ground, the goal will be to dig a mold that we will line with our liner. After digging the mold (or form), remove all rocks, sticks, and sharp objects that could later cause a problem with the liner. Next, extra padding will be provided to insure a safe, long-term, non-punctured liner. First, line the hole in the ground with about 1” of wet sand. On top of that, add a layer of wet newspaper (over time, the newspaper breaks down into a pulp that acts like glue and will seal any small punctures that may occur in the liner). Now the liner can be put into the form and then slowly begin to fill the pond. Be sure there is an equal amount of excess liner around the whole border of the pond as this will be needed for the rock edging. As the pond fills with water, you will need to stretch the liner to smooth out wrinkles and make folds and creases at the corners and bends. When the pond is close to being filled, begin the rock work finish to go around the pond. Fold the border overlap over the first rock and place a rock on top of the liner flap. Do this around the entire perimeter of the pond until you have a finished product . Water pumps are used to provide water circulation and movement within the pond. This helps to prevent the pond from becoming stagnant and to increase gas exchange within the pond (oxygen in and carbon dioxide out). The pump size should be such that it turns over the entire pond 1/2 to 1 time per hour. For example, an 800 gallon pond should use a pump capable of 400 to 800 gallons per hour. Always use a stronger pump on ponds that are heavily stocked with fish. Pumps are generally used in conjunction with fountains, waterfalls and filters. Filters need to be used when keeping fish. Filters, which can be mechanical, biological and chemical, work the same way as aquarium filters and need to be maintained the same way. Internal filters are submerged in the pond and connected to the submerged water pump. External filters sit outside the pond and are connected to a submerged water pump in the pond. The filter can be camouflaged with plants, bushes, and rocks, or buried in the ground. The water, after it passes through the filter, is returned to the pond through an overflow or in a waterfall. The number one challenge pond gardens run into is algae. Generally, there are two types: green, soupy water (algae blooms), and long, stringy hair grass (macro algae growing on rocks and sides of the pond). All kinds of algae grow in response to excess nutrients and excess light. All ponds go through an algae bloom phase early in the spring (March through May) or in a newly set up pond. 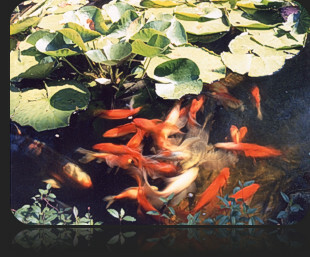 This is a normal and natural process of the pond water reaching a balanced condition. Leave it alone—it will clear up on its own as long as oxygenating plants are used. Do not change the water, or add an algae remover product at this time. Three to four days after setting up a new pond, oxygenating plants (i.e. Anacharis, Foxtail, Parrots Feather or Hornwort) need to be placed in the pond. They should be planted in pots (two bunches per pot) and then submerged in the bottom of the pond (approximately one 2-bunch plant pot per 100 gallons). As we’ve learned, algae blooms are caused by excessive nutrients. These nutrients will now be utilized by the oxygenating plants, thus removing the food source causing the green water/algae blooms. About 2 weeks after oxygenating plants are introduced, floating plants should be added. As the summer progresses, the floating plants will eventually grow to cover 2/3 of the pond surface. This, along with the submerged oxygenating plants, will naturally prevent algae blooms and green water for the pond season. Using an ultraviolet sterilizer is an extremely effective way to kill all free floating algae cells and successfully prevent green water/algae blooms all summer long. A water pump (in the pond) pumps water to an external U.V. filter where the water is sterilized and returned back to the pond. A pond shade (blue dye or tint in liquid form) can be added to the water, minimizing the light being transmitted into the pond. This will help prevent green water/algae blooms. Chemical algaecides sometimes work temporarily, but eventually algae will grow that is resistant to the algaecide. 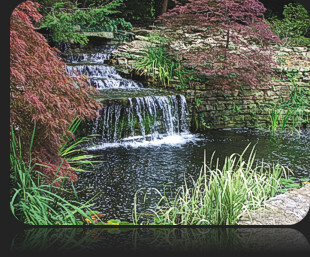 As with any hobby or project, there are always some additional options available to make your water garden even more enjoyable and easier to maintain. You might purchase accessories just as you would do for an aquarium– test kits for monitoring water quality, ammonia, nitrite and pH; fish nets for catching and moving fish; pond nets/skimmers to help keep floating debris and leaves out of the pond; water conditioners to dechlorinate and condition the water for fish and plants. 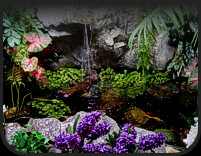 Finally, the ultimate water garden landscaping equipment– lights around the outside of the pond, and submerged in the pond for very special accent effects. With the right information and proper planning, your water garden should be an enjoyable and easy to maintain backyard garden feature for years to come! For those who love gardening and being creative, deciding on the varieties to be planted in the different pond zones is the best part! Some of the better choices available are listed below.